A very informative article—“Guess Which State Towers Above All Others on Wind Energy” (first in News section)— inspired this commentary. 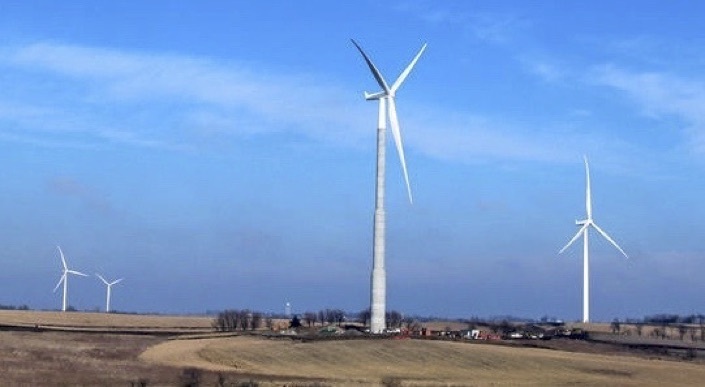 Remarkably, the newest and tallest wind turbine in the U.S. has been built in Iowa. A fascinating must-see 4-minute video reveals the entire construction of this gargantuan sized, concrete-and-steel monolith, as depicted in fast-motion time. Aside from marveling at the technological achievement, one cannot but be impressed at the amount of effort expended during the planning and construction process. Even more striking is the volume of special equipment and expertise needed to complete such a complex project. It’s also mind-blowing to contemplate the total fossil-fuel energy used to extract, process, transport, and install all materials used in this enormous structure, plus cleaning up the site and providing ongoing maintenance to keep the turbine functioning well. Another related article —“The Real EROI of Photovoltaic Systems” (last article in Views)—addresses solar power, a competitive renewable energy source. The author uses the acronym EROI, which stands for “energy returned on investment”, but other sources use EROEI (energy returned on energy invested), which I prefer. After viewing the educational video showing the construction of the gigantic Iowan wind turbine, I can only wonder what the EROEI ratio will ultimately be—when overall energy costs are tabulated. I suspect that, as the world economy falters over time—due to such factors as climate change, overpopulation, and dwindling resources—these monolithic structures will become too expensive to consider as feasible energy producers. Let’s hope this is not the case. In pulling these two articles together, I couldn’t resist creating some spoofy lyrics connecting Iowa farms and farmers to the growing numbers of wind farms in that state. I’ve taken some liberties in adapting the lyrics to the familiar tune, “Old MacDonald Had a Farm”. Please sing along, using the lyrics. And on this farm he has much wind, EROEI. Here a swoosh, there a swoosh, everywhere swoosh, swoosh. On Johanson’s Iowa farm wind turbines run on air. > Resilience: Lived Crisis Vs. Systemic Crisis: Notes On A “New Narrative” (Erik Lindberg). Sustainability, except when proposed as a green fantasy, requires difficult choices and the acceptance of counter-intuitive truths. Because the change from a modern mind-set bent entirely on growth, expansion, competition, and accumulation will be difficult on so many levels, a suitable transitional narrative will be equally difficult and complex. Simple narratives won’t suffice. A new narrative will need to be prickly enough to resist easy appropriation, yet warm and fuzzy enough to draw people in; difficult and rigorous in its concepts to make it relatively slogan-proof, yet accessible enough to engage a distracted people. Two recent narratives that have, to my mind, fulfilled these criteria are Rob Hopkins’ Transition Handbook and Pope Francis’ On Care for our Common Home. > Resource Insights: Saudi Arabia Is Planning For The Post-Oil Era, Why Not The United States? (Kurt Cobb). The world’s largest exporter of crude oil, the Kingdom of Saudi Arabia, recently announced a plan for its post-oil future. If a country almost synonymous with the oil economy can see the need for such a plan, how can the rest of the world, particularly the United States, the world’s largest consumer of petroleum, not see the necessity of such foresight? The kingdom’s plan includes sale of part of Saudi Aramco, the world largest oil company and currently wholly-owned by the Saudi government. The company controls all oil development in Saudi Arabia. That the Saudis want to sell part of the most valuable company in the world means they have a different view about the future of oil than those who will be buying. The Saudi move toward a post-oil economy ought to be one of the strongest messages ever that the world is moving closer to a peak and decline in world oil production. > Resilience: This Is Peak Oil (Luis de Sousa). These two years of supply destructive prices have pushed various important petroleum nations and regions to the brink. If there is some unexpected event shaking up the petroleum market, it will likely be in one of these places: Iraq, Nigeria, Venezuela, Canada, Angola, Azerbaijan, Mexico, Brazil, or North Sea. The Take Away: “Shale oil” is effectively insulated from prices by the US finance industry’; Present supply destruction cycle is coming to an end; After two years of low prices, extraction is set for a multi-year decline; New demand destruction cycle to start in the next 18 months, depending on how stocks are managed; A return to an extraction rate of 80 Mb/d seems unlikely for the foreseeable future; and Can it ever return? > The Archdruid Report: Against Cultural Senility (John Michael Greer). When the United States still had an educational system that worked, it sorted itself out into three broad categories of schools: public schools, trade schools, and universities. Universities existed to launch students into a full-on, face-first encounter with that foreign country we call the past. That’s why the university curriculum back then focused on such subjects as history, classics, literature, and the like—and why the word “literature” in an academic setting generally excluded anything written within living memory. The [postmodern] crusade for relevance and the mass production of new departments and degree programs redirected attention from the past to the present. Popular though these moves were in the academic industry, I’d like to suggest that they were disastrously misguided at best, and have played a large role in helping to generate a widespread, and seriously destructive condition in our collective life. > Cassandra’s Legacy: The Real EROI Of Photovoltaic Systems: Professor Hall Weighs In (Charles Hall, Ugo Bardi). The EROI (energy returned on investment) of our various energy options, and its associated issues, may be the most important issues that will face future civilizations. The present discussion tends to vacillate between people who accept (or advocate) very high EROIs for solar versus people who accept (or advocate) such very low EROIs. My point is that we need to include empirical, not theoretical, estimates of ALL the energy used to make these systems work. There are at least three reasons that EROI estimates appear much wider than they probably really are: 1) they are often done by advocates one way or another, not by experienced, objective (and peer reviewed) analysts; 2) a common protocol is not followed; and 3) data related to above appropriate boundaries are often not used. > Resilience: Possible Energy Constraints To Further Urbanization (Richard Heinberg; an excerpt from his latest book: Can a City Be Sustainable?). Civilization is defined, literally, by city dwelling (civis, the Latin root of the word civilization, means “city”). Urban living historically has brought with it social stratification and full-time division of labor. As civilizations expand, they urbanize; when they fail, cities empty out and people return to subsistence agriculture or foraging. The process of collapse typically entails massive mortality. As ancient civilizations crumbled, absent sound leadership from elites, people responded by creating new, simpler social and economic arrangements that required smaller energy investments. We can see the faint beginnings of similar trends today in the “sharing economy,” in organizations of young Idealistic organic farmers, and In transition Initiatives. > NRDC On Earth: Guess Which State Towers Over All The Others On Wind Energy? (Jeff Turrentine). A strangely enthralling time-lapse video depicts the erection of the tallest land-based wind turbine in the U.S.— in the middle of Adams County, Iowa. Measuring 379 feet from ground to rotor, the concrete turbine positively dwarfs its 63 steel-towered neighbors on MidAmerican Energy’s new Adams wind farm, besting most of them by 100 feet or more. In Iowa, the state’s massive investment in wind has led directly to lower energy prices; one recent report estimates that it will end up saving Iowans $3.68 billion on their electricity bills by the middle of this century. On top of that, more than 7,000 people in the state are currently employed in the manufacture and maintenance of wind infrastructure. > Scientific American: 10 Ways Climate Science Has Advanced Since An Inconvenient Truth (Gayathri Valdyanathan). With the 10-year anniversary of “An Inconvenient Truth” coming up this week, ClimateWire reviewed the film to see if the science still held up and found a number of its predictions have since come true. In some cases, the reality is even worse than the forecasts. And a few times, Gore got it wrong. > NPR: A Warming World Means Less Water, With Economic Consequences (Staff). High and Dry: Climate Change, Water, and the Economy examines the future effects of diminishing water supplies on the world. “Water-related climate risks cascade through food, energy, urban, and environmental systems,” researchers write. “Growing populations, rising incomes, and expanding cities will converge upon a world where the demand for water rises exponentially, while supply becomes more erratic and uncertain.” The World Bank says that in areas where water is readily available, like Central Africa and East Asia, it could become harder to find. And in areas like the Middle East, already facing water problems, “scarcity will greatly worsen.” The authors also note the spikes in food prices a water shortage would cause, which in turn would likely lead to conflict. > Ars Technica: No, This Isn’t The Start Of The Antibiotic Apocalypse, Just Bad Reporting (Beth Mole). Researchers reported Thursday that a 49-year-old Pennsylvania woman was infected with an E. coli strain that’s resistant to the last-resort antibiotic colistin. Upon DNA analysis, researchers determined that the E. coli is resistant to colistin because it carries a colistin-resistance gene called mcr-1 on a circular piece of DNA called a plasmid. The study appears in the journal Antimicrobial Agents and Chemotherapy. Since the initial report, mcr-1-toting bacteria have been discovered on every continent. And the infected PA woman, who was suffering from a urinary tract infection, had not traveled in the last five months. While concerns still stand, the alarmist headlines are unnecessary—and so are the errors. > Star Tribune: Zika Threat Draws Calls For Prevention (Jeremy Olson). Minnesota’s U.S. senators gathered infectious-disease experts at the U of MN on Friday to discuss the Zika virus, amid research showing that a species of mosquito endemic to the Midwest could spread the virus in this state. While causing little more than cold symptoms in most cases, a Zika infection in pregnant women can cause birth defects, and in others a rare cause of Guillain-Barré disorder, which severely weakens leg and arm muscles. Zika spread rapidly throughout South and Central America in recent months, but only emerged in the United States with winter travelers bitten by infected mosquitoes. So far there are 17 cases of Minnesotans contracting Zika on tropical trips, a disproportionate 4 percent of the nation’s 544 cases. On Thursday the WHO found that yellow fever, an African yellow fever mosquito-borne infection, has a higher fatality rate than Zika, but isn’t yet a global emergency. > Daily KOS: 1,000,000,000 Birds – Just Gone (Austin Bailey). A billion birds have disappeared from North America since 1970, and a third of bird species across the continent are threatened with extinction. The first State of North America’s Birds report finds that of 1,154 bird species that live in and migrate among Canada, the U.S. and Mexico, 432 are of “high concern” due to low or declining populations, shrinking ranges and threats such as human-caused habitat loss, invasive predators and climate change. > NH Labor News: Our Failure To Invest In Infrastructure Is Actually Costing You Thousands (Matt Murray). Failing to properly invest in maintaining and rebuilding our infrastructure is costing Americans thousands of dollars a year and it is about to get worse. “From 2016 to 2025, each household will lose $3,400 each year in disposable income due to infrastructure deficiencies.” American Society of Civil Engineers warned that if this infrastructure gap is not closed, by 2025, households would lose $5,100 annually and the economy could lose over $4 trillion in GDP. America is currently spending more failing to act on our investment gap then we would to close it. Inefficient infrastructure is costing every household $9.30 a day. However, if every family instead invested an additional $3 a day per household, we could close the infrastructure investment gap in 10 years,” added ASCE. > Grist: Even The World’s Largest Food Company Knows The American Diet Is An Environmental Catastrophe (Nathan Halverson). If the rest of the world ate like Americans, the planet would have run out of freshwater 15 years ago, according to the world’s largest food company. In private, Nestle executives told U.S. officials that the world is on a collision course with doom because Americans eat too much meat, and now, other countries are following suit, according to a secret U.S. report titled “Tour D’Horizon with Nestle: Forget the Global Financial Crisis, the World Is Running Out of Fresh Water.” The planet is a on a “potentially catastrophic” course as billions of people in countries such as India and China begin eating more beef, chicken, and pork like their counterparts in Western countries. > Platts: Natural Gas Prices To Stay Low, US Renewables To Grow: Survey (Mark Watson). 92% of energy executives surveyed for KPMG’s 2016 Energy Business Outlook said they expect natural gas prices to stay below $3/MMBtu in 2016, and 62% estimate that renewable resources will supply half of the US footprint’s power by 2045. 41% percent of survey respondents said they expect big changes in utility business models to a more distributed and unbundled model that changes how energy is generated and delivered. 94% of respondents said their organization’s operating model would probably be disrupted in the next three to five years, 92% said their company would be involved in a merger or acquisition over the next two years, and 73% said they expect their company’s work force would remain the same or decrease over the next two years. > Bloomberg: Clean-Energy Jobs Surpass Oil Drilling For First Time In U.S. (Anna Hirtenstein). The number of U.S. jobs in solar energy overtook those in oil and natural gas extraction for the first time last year, helping drive a global surge in employment in the clean-energy business as fossil-fuel companies faltered. Employment in the U.S. solar business grew 12 times faster than overall job creation, the International Renewable Energy Agency said in a report on Wednesday. About 8.1 million people worldwide had jobs in the clean energy in 2015, up from 7.7 million in 2014, according to the industry group based in Abu Dhabi. > Scientific American: U.S. Military Develops Strategies To Prevent Climate Wars (Andrew Holland). Democrats and Republicans may often be at odds over climate change, but the U.S. military is not waiting for the debate to be settled. It is preparing for a hotter world, which is already altering geopolitical relations and could lead to armed conflict. The U.S. military does not explicitly say that climate change will directly cause wars, but it does call it an “accelerant of instability” or “threat multiplier”. Africa is the most vulnerable continent to unrest caused by climate change. Other potential hot spots include the Asia-Pacific region, the Middle East, and the Artic. > CASSE: No Mere Resolution: The Vermont Legislature And The Steady State (Brian Czech). On May 6, 2016, the Legislature of the State of Vermont passed H.C.R. 412, “House Concurrent Resolution Honoring the Center for the Advancement of the Steady State Economy for Its Important Work.” In a nation where political support for a steady state economy have only just begun, the Vermont Legislature has offered prescient precedents: 1) The steady state economy – the only sustainable alternative to unsustainable growth or recession – was brought out of its academic niche into mainstream political dialog; 2) proved that the phrase “steady state economy” is not the bogeyman it was thought to be by the architects and activists of the “new economy” movement; and 3) loaded H.C.R. 412 with implications for future adjustments to tax codes, budgets, program goals and incentives of all kinds. It’s refreshing that some politicians are focused on the long-term big picture. > Resilience: Resilience + Resistance: A Recipe For Justice And Sustainability (Chuck Collins, Sarah Byrnes). In the face of climate change, we have the dual challenge of both resisting new fossil fuel infrastructure projects and building a resilient, sustainable and equitable economy in the shell of the old. Both resistance and resilience-building are necessary. Resistance requires a bold assertion of community rights and individual voices to interrupt, block, and prevent encroachment by a politically powerful fossil fuel industry. Resilience requires creativity, resourcefulness and reskilling – along with focus on the long haul and building institutions. > Slow Money Journal: Soil4Climate: New Organization Fights Global Warming From The Ground Up (Eric Becker). Soil4Climate is the inspired result of work by innovative farmers, ranchers and other land managers who are increasing soil carbon while providing environmental and health benefits. As it turns out, nature is our most powerful ally in the fight against global warming. The ability for soil to capture atmospheric carbon is awe evoking. When we work to enhance this natural process, we get nourishing food and biodiverse spaces while also helping to assure a livable future. Soil4Climate evolved out of an understanding that the climate crisis has reached a point where even eliminating the use of fossil fuels would not prevent an oncoming calamity. > Bill Moyers: Why Rural Communities Need To Talk About Climate Change (Anna Claussen). There is a common misconception that you can’t talk about climate change in rural communities because the issue is considered too polarizing. Despite their differing viewpoints, the 18 participants in the Minnesota Winona County Climate Dialogue produced a collective statement and action plan, crafted solely using participant input, based on six topical presentations from local experts on weather trends, energy use, water, insurance, public health and agriculture in Winona County. The Winona plan acknowledged that climate change “will have a real measurable impact on our overall economy, our environment, fish and wildlife habitat, health, insurance rates and more. To get past politics and toward solutions we must first recognize that rural politics are uniquely personal. For the last year and a half, Institute for Agriculture and Trade Policy and the Jefferson Center have organized a series of Rural Climate Dialogues (RCDs). > Peak Surfer: The Great Change: Epiconomics 102 : The Sunlight Economy (Albert Bates). The adoption of The Paris Agreement by 195 countries on December 12, 2015 marks the end of the era of fossil fuels. There is no way to meet the targets laid out in this agreement without keeping 90 percent or more of remaining coal, oil and gas in the ground. The final text still has some serious gaps, and the timetable will have to speed up, but the treaty draws a red line on atmospheric CO2 we cannot cross. As science, economics and law come into alignment, a solar-powered economy is barreling at us with unstoppable force. A bioeconomy is coming. Fast. There are demonstrations of it, large and small, popping up all over the world. > Citizens for Sustainability: Forum-Meeting. Sat., June 11, 10am-noon, St. Anthony Village Community Ctr., 3301 Silver Lake Rd. Public welcome.